The Mason Jar’s Chicken Tortilla Soup is a complex soup that has a lot of spices and fresh vegetables. 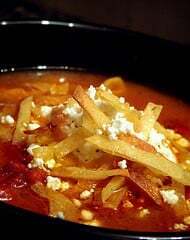 Make the Mason Jar Tortilla Soup at home. Do you have the curry dip recipe that the “Jar” serves with their steamed artichokes? I’m going to need that too! The Mason Jar is a restaurant in Houston, TX, located off the Katy Frwy. This is their soup. They printed the recipe in the Houston Chronicle some years back and I still have the clipping. I have made it many times, and trust me, you don’t have to use all that butter. I usually cut the recipe in half (it makes enough for a crowd otherwise), keep the spice amounts the same, and only use about 2 TBL of butter with an equal amount of olive oil. Everyone raves over it. This is a very thick, hearty soup. You could probably skip the flour roux and still have a nice, thick soup with just the tortillas. We garnish with pepperjack cheese, diced avacado and chopped green onions with the tortilla strips. A little squirt of lime is pretty good too. Great tip on the butter, I know not everyone wants to use all of that butter. I have the original too. Didn’t want to dig it out so I pulled up this one. I’ve had it since 95 I think around Christmas time because I made it the first time in Feb 1997. I am glad you enjoy the soup. I know of a home owned restaurant by that name in Colorado…not sure if this would be the same place. If so, they have AMAZING “Stuffed Bell Pepper soup”-which I got the recipe from the owner of the place itself…they actually have copies they hand out of it because people ask for it soooo much, they also have GREAT great chicken salad sandwiches and the list goes on,really! This was from a chain restaurant that was located in Texas, this is not that home owned restaurant in Colorado. 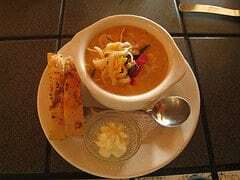 Had lunch at the Mason Jar Restaurant in CO Springs today & had the Stuffed Bell Pepper Soup. It was delicious! We didn’t think to actually ask for the recipe. Could you share it ? I’d love to make it at home. I’ll have to keep your suggestion in mind! This recipe sounds wonderful! At first I was thinking this was made in a mason jar but I guess Mason Jar must be a restaurant?